As writers, designers and illustrators, we’re paid to be creative. We’re expected to come up with great ideas every single day for each project we’re working on. And I’m not going to lie, sometimes it’s just plain hard. Everyone has different strategies to get their creative juices flowing. During the workday, my fellow RedHouse creatives and I have found getting up and away from our desks, even if it’s just for 10 minutes or so, often does the trick. We’ll go for a walk around the building, toss the football around, or find a sunny spot outside to take in some fresh air. 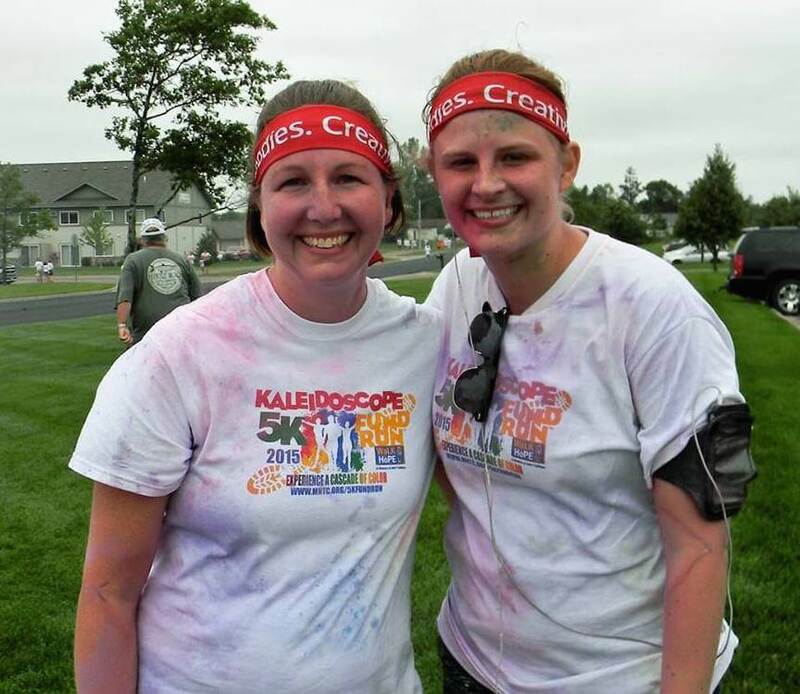 The “after” photo – Heidi and Courtney after this summer’s 5K Color Run. Dain taking in the view after hiking to one of the North Shore’s scenic peaks. 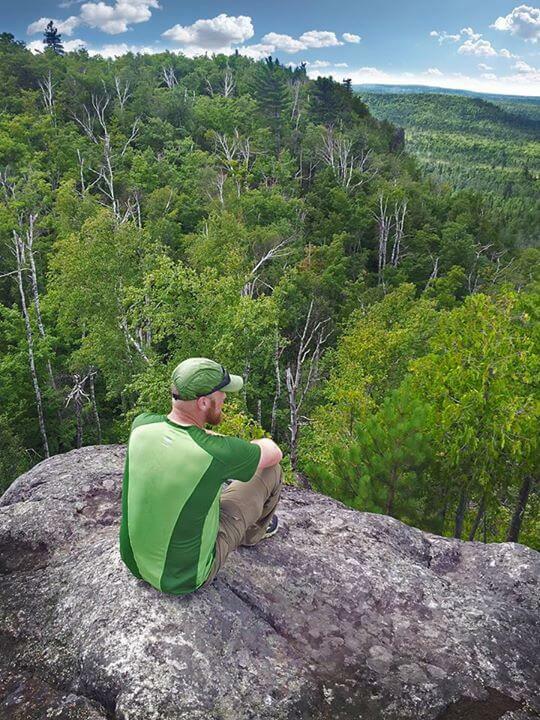 Aaron uses the Cuyuna Lakes Mountain Bike Trails to unwind after a busy work day. It’s actually scientifically proven that physically moving can inspire creativity. This article from health.com says when you exercise, your body flushes out the hormone that reacts to stress (often shutting down brain functions for creativity and problem-solving), and increases oxygen in the blood, which helps provide mental energy. encouraging everyone to get out and move after work each day. Many of us trained for a 5K, the Minnesota Adult and Teen Challenge Kaleidoscope Fund Run, and had an absolute blast participating, getting covered in color along the way. While some of us enjoy pounding the pavement, others find solace on the mountain bike trails, or backpacking through the woods. The point is, if you’re having trouble finding your creative spark it helps to MOVE. Pick a low-concentration exercise that allows your mind to wander, such as brisk walking, swimming laps, hiking, or running. Sports, such as golf or tennis, or team activities, like soccer or basketball require too much strategizing or in-the-moment focus. Exercise for a decent duration—at least 30 minutes. Unless you and a partner plan to brainstorm on a shared project, exercise alone. Bring a notepad or tape recorder so you can jot down brilliant ideas. Get to work right after you return, while your creative juices are flowing. The shower can wait! The fun continues, even in the winter months. We’re already planning our next Healthy Bodies, Creative Minds event — Snowshoeing! (Or cross country skiing for those so inclined.) Mark your calendars for Feb. 20, 2016. We’re heading to Mille Lacs Kathio State Park for their annual Candlelight Ski adventure. There will be more info to come, but it’s never too early to start prepping those leg muscles. Now move!